"Electrical storm" and "TSTM" redirect here. For other uses, see Electrical storm (disambiguation). For the musical ensemble, see Thirty Seconds to Mars. For other uses, see Thunderstorm (disambiguation). Primarily tropical and also temperate regions. Most common in spring and summer. Depends on the storm, may involve rain, hail, and/or high winds. May cause flooding or fires. A thunderstorm, also known as an electrical storm or a lightning storm, is a storm characterized by the presence of lightning and its acoustic effect on the Earth's atmosphere, known as thunder. Relatively weak thunderstorms are sometimes called thundershowers. Thunderstorms occur in a type of cloud known as a cumulonimbus. They are usually accompanied by strong winds, and often produce heavy rain and sometimes snow, sleet, or hail, but some thunderstorms produce little precipitation or no precipitation at all. Thunderstorms may line up in a series or become a rainband, known as a squall line. Strong or severe thunderstorms include some of the most dangerous weather phenomena, including large hail, strong winds, and tornadoes. Some of the most persistent severe thunderstorms, known as supercells, rotate as do cyclones. 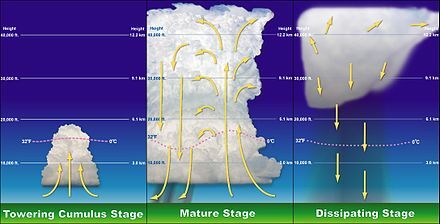 While most thunderstorms move with the mean wind flow through the layer of the troposphere that they occupy, vertical wind shear sometimes causes a deviation in their course at a right angle to the wind shear direction. Thunderstorms result from the rapid upward movement of warm, moist air, sometimes along a front. As the warm, moist air moves upward, it cools, condenses, and forms a cumulonimbus cloud that can reach heights of over 20 kilometres (12 mi). As the rising air reaches its dew point temperature, water vapor condenses into water droplets or ice, reducing pressure locally within the thunderstorm cell. Any precipitation falls the long distance through the clouds towards the Earth's surface. As the droplets fall, they collide with other droplets and become larger. The falling droplets create a downdraft as it pulls cold air with it, and this cold air spreads out at the Earth's surface, occasionally causing strong winds that are commonly associated with thunderstorms. Thunderstorms can form and develop in any geographic location but most frequently within the mid-latitude, where warm, moist air from tropical latitudes collides with cooler air from polar latitudes. Thunderstorms are responsible for the development and formation of many severe weather phenomena. Thunderstorms, and the phenomena that occur along with them, pose great hazards. Damage that results from thunderstorms is mainly inflicted by downburst winds, large hailstones, and flash flooding caused by heavy precipitation. Stronger thunderstorm cells are capable of producing tornadoes and waterspouts. There are four types of thunderstorms: single-cell, multi-cell cluster, multi-cell lines and supercells. Supercell thunderstorms are the strongest and most severe. Mesoscale convective systems formed by favorable vertical wind shear within the tropics and subtropics can be responsible for the development of hurricanes. Dry thunderstorms, with no precipitation, can cause the outbreak of wildfires from the heat generated from the cloud-to-ground lightning that accompanies them. Several means are used to study thunderstorms: weather radar, weather stations, and video photography. Past civilizations held various myths concerning thunderstorms and their development as late as the 18th century. Beyond the Earth's atmosphere, thunderstorms have also been observed on the planets of Jupiter, Saturn, Neptune, and, probably, Venus. Stages of a thunderstorm's life. All thunderstorms, regardless of type, go through three stages: the developing stage, the mature stage, and the dissipation stage. The average thunderstorm has a 24 km (15 mi) diameter. Depending on the conditions present in the atmosphere, each of these three stages take an average of 30 minutes. The first stage of a thunderstorm is the cumulus stage or developing stage. During this stage, masses of moisture are lifted upwards into the atmosphere. The trigger for this lift can be solar illumination, where the heating of the ground produces thermals, or where two winds converge forcing air upwards, or where winds blow over terrain of increasing elevation. The moisture carried upward cools into liquid drops of water due to lower temperatures at high altitude, which appear as cumulus clouds. As the water vapor condenses into liquid, latent heat is released, which warms the air, causing it to become less dense than the surrounding, drier air. The air tends to rise in an updraft through the process of convection (hence the term convective precipitation). This process creates a low-pressure zone within and beneath the forming thunderstorm. In a typical thunderstorm, approximately 500 million kilograms of water vapor are lifted into the Earth's atmosphere. In the mature stage of a thunderstorm, the warmed air continues to rise until it reaches an area of warmer air and can rise no farther. Often this 'cap' is the tropopause. The air is instead forced to spread out, giving the storm a characteristic anvil shape. The resulting cloud is called cumulonimbus incus. The water droplets coalesce into larger and heavier droplets and freeze to become ice particles. As these fall, they melt to become rain. If the updraft is strong enough, the droplets are held aloft long enough to become so large that they do not melt completely but fall as hail. While updrafts are still present, the falling rain drags the surrounding air with it, creating downdrafts as well. The simultaneous presence of both an updraft and a downdraft marks the mature stage of the storm and produces cumulonimbus clouds. During this stage, considerable internal turbulence can occur within, which manifests as strong winds, severe lightning, and even tornadoes. Typically, if there is little wind shear, the storm will rapidly enter the dissipating stage and 'rain itself out', but, if there is sufficient change in wind speed or direction, the downdraft will be separated from the updraft, and the storm may become a supercell, where the mature stage can sustain itself for several hours. In the dissipation stage, the thunderstorm is dominated by the downdraft. If atmospheric conditions do not support super cellular development, this stage occurs rather quickly, approximately 20–30 minutes into the life of the thunderstorm. The downdraft will push down out of the thunderstorm, hit the ground and spread out. This phenomenon is known as a downburst. The cool air carried to the ground by the downdraft cuts off the inflow of the thunderstorm, the updraft disappears and the thunderstorm will dissipate. Thunderstorms in an atmosphere with virtually no vertical wind shear weaken as soon as they send out an outflow boundary in all directions, which then quickly cuts off its inflow of relatively warm, moist air, and kills the thunderstorm's further growth. The downdraft hitting the ground creates an outflow boundary. This can cause downbursts, a potential hazardous condition for aircraft to fly through, as a substantial change in wind speed and direction occurs, resulting in a decrease of airspeed and the subsequent reduction in lift for the aircraft. The stronger the outflow boundary is, the stronger the resultant vertical wind shear becomes. There are four main types of thunderstorms: single-cell, multi-cell, squall line (also called multi-cell line) and supercell. Which type forms depends on the instability and relative wind conditions at different layers of the atmosphere ("wind shear"). Single-cell thunderstorms form in environments of low vertical wind shear and last only 20–30 minutes. Organized thunderstorms and thunderstorm clusters/lines can have longer life cycles as they form in environments of significant vertical wind shear, normally greater than 25 knots (13 m/s) in the lowest 6 kilometres (3.7 mi) of the troposphere, which aids the development of stronger updrafts as well as various forms of severe weather. The supercell is the strongest of the thunderstorms, most commonly associated with large hail, high winds, and tornado formation. Precipitable water values of greater than 31.8 millimetres (1.25 in) favor the development of organized thunderstorm complexes. Those with heavy rainfall normally have precipitable water values greater than 36.9 millimetres (1.45 in). Upstream values of CAPE of greater than 800 J/kg are usually required for the development of organized convection. A single-cell thunderstorm over Wagga Wagga. This term technically applies to a single thunderstorm with one main updraft. Also known as air-mass thunderstorms, these are the typical summer thunderstorms in many temperate locales. They also occur in the cool unstable air that often follows the passage of a cold front from the sea during winter. Within a cluster of thunderstorms, the term "cell" refers to each separate principal updraft. Thunderstorm cells occasionally form in isolation, as the occurrence of one thunderstorm can develop an outflow boundary that sets up new thunderstorm development. Such storms are rarely severe and are a result of local atmospheric instability; hence the term "air mass thunderstorm". When such storms have a brief period of severe weather associated with them, it is known as a pulse severe storm. Pulse severe storms are poorly organized and occur randomly in time and space, making them difficult to forecast. Single-cell thunderstorms normally last 20–30 minutes. A group of thunderstorms over Brazil photographed by the Space Shuttle Challenger. This is the most common type of thunderstorm development. Mature thunderstorms are found near the center of the cluster, while dissipating thunderstorms exist on their downwind side. Multicell storms form as clusters of storms but may then evolve into one or more squall lines. While each cell of the cluster may only last 20 minutes, the cluster itself may persist for hours at a time. They often arise from convective updrafts in or near mountain ranges and linear weather boundaries, such as strong cold fronts or troughs of low pressure. These type of storms are stronger than the single-cell storm, yet much weaker than the supercell storm. Hazards with the multicell cluster include moderate-sized hail, flash flooding, and weak tornadoes. A squall line is an elongated line of severe thunderstorms that can form along or ahead of a cold front. In the early 20th century, the term was used as a synonym for cold front. The squall line contains heavy precipitation, hail, frequent lightning, strong straight line winds, and possibly tornadoes and waterspouts. Severe weather in the form of strong straight-line winds can be expected in areas where the squall line itself is in the shape of a bow echo, within the portion of the line that bows out the most. Tornadoes can be found along waves within a line echo wave pattern, or LEWP, where mesoscale low pressure areas are present. Some bow echoes in the summer are called derechos, and move quite fast through large sections of territory. On the back edge of the rain shield associated with mature squall lines, a wake low can form, which is a mesoscale low pressure area that forms behind the mesoscale high pressure system normally present under the rain canopy, which are sometimes associated with a heat burst. This kind of storm is also known as "Wind of the Stony Lake" (Traditional Chinese:石湖風 – shi2 hu2 feng1, Simplified Chinese: 石湖风) in southern China. A supercell thunderstorm over Chaparral, New Mexico. The setting sun illuminates the top of a classic anvil-shaped thunderstorm cloud in eastern Nebraska, United States. Supercell storms are large, usually severe, quasi-steady-state storms that form in an environment where wind speed or wind direction varies with height ("wind shear"), and they have separate downdrafts and updrafts (i.e., where its associated precipitation is not falling through the updraft) with a strong, rotating updraft (a "mesocyclone"). These storms normally have such powerful updrafts that the top of the supercell storm cloud (or anvil) can break through the troposphere and reach into the lower levels of the stratosphere, and supercell storms can be 24 kilometres (15 mi) wide. Research has shown that at least 90 percent of supercells cause severe weather. These storms can produce destructive tornadoes, extremely large hailstones (10 centimetres or 4 inches diameter), straight-line winds in excess of 130 km/h (81 mph), and flash floods. In fact, research has shown that most tornadoes occur from this type of thunderstorm. Supercells are generally the strongest type of thunderstorm. In the United States, a thunderstorm is classed as severe if winds reach at least 93 kilometres per hour (58 mph), hail is 25 millimetres (1 in) in diameter or larger, or if funnel clouds or tornadoes are reported. Although a funnel cloud or tornado indicates a severe thunderstorm, a tornado warning is issued in place of a severe thunderstorm warning. A severe thunderstorm warning is issued if a thunderstorm becomes severe, or will soon turn severe. In Canada, a rainfall rate greater than 50 millimetres (2 in) in one hour, or 75 millimetres (3 in) in three hours, is also used to indicate severe thunderstorms. Severe thunderstorms can occur from any type of storm cell. However, multicell, supercell, and squall lines represent the most common forms of thunderstorms that produce severe weather. A mesoscale convective system (MCS) is a complex of thunderstorms that becomes organized on a scale larger than the individual thunderstorms but smaller than extratropical cyclones, and normally persists for several hours or more. A mesoscale convective system's overall cloud and precipitation pattern may be round or linear in shape, and include weather systems such as tropical cyclones, squall lines, lake-effect snow events, polar lows, and mesoscale convective complexes (MCCs), and they generally form near weather fronts. Most mesoscale convective systems develop overnight and continue their lifespan through the next day. The type that forms during the warm season over land has been noted across North America, Europe, and Asia, with a maximum in activity noted during the late afternoon and evening hours. Forms of MCS that develop in the tropics are found in use either the Intertropical Convergence Zone or monsoon troughs, generally within the warm season between spring and fall. More intense systems form over land than over water. One exception is that of lake-effect snow bands, which form due to cold air moving across relatively warm bodies of water, and occurs from fall through spring. Polar lows are a second special class of MCS. They form at high latitudes during the cold season. Once the parent MCS dies, later thunderstorm development can occur in connection with its remnant mesoscale convective vortex (MCV). Mesoscale convective systems are important to the United States rainfall climatology over the Great Plains since they bring the region about half of their annual warm season rainfall. The two major ways thunderstorms move are via advection of the wind and propagation along outflow boundaries towards sources of greater heat and moisture. Many thunderstorms move with the mean wind speed through the Earth's troposphere, the lowest 8 kilometres (5.0 mi) of the Earth's atmosphere. Weaker thunderstorms are steered by winds closer to the Earth's surface than stronger thunderstorms, as the weaker thunderstorms are not as tall. Organized, long-lived thunderstorm cells and complexes move at a right angle to the direction of the vertical wind shear vector. If the gust front, or leading edge of the outflow boundary, races ahead of the thunderstorm, its motion will accelerate in tandem. This is more of a factor with thunderstorms with heavy precipitation (HP) than with thunderstorms with low precipitation (LP). When thunderstorms merge, which is most likely when numerous thunderstorms exist in proximity to each other, the motion of the stronger thunderstorm normally dictates the future motion of the merged cell. The stronger the mean wind, the less likely other processes will be involved in storm motion. 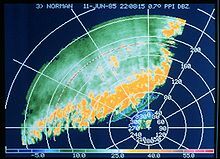 On weather radar, storms are tracked by using a prominent feature and tracking it from scan to scan. Each year, many people are killed or seriously injured by severe thunderstorms despite the advance warning. While severe thunderstorms are most common in the spring and summer, they can occur at just about any time of the year. A return stroke, cloud-to-ground lightning strike during a thunderstorm. Cloud-to-ground lightning frequently occurs within the phenomena of thunderstorms and have numerous hazards towards landscapes and populations. One of the more significant hazards lightning can pose is the wildfires they are capable of igniting. Under a regime of low precipitation (LP) thunderstorms, where little precipitation is present, rainfall cannot prevent fires from starting when vegetation is dry as lightning produces a concentrated amount of extreme heat. Direct damage caused by lightning strikes occurs on occasion. In areas with a high frequency for cloud-to-ground lightning, like Florida, lightning causes several fatalities per year, most commonly to people working outside. Acid rain is also a frequent risk produced by lightning. Distilled water has a neutral pH of 7. “Clean” or unpolluted rain has a slightly acidic pH of about 5.2, because carbon dioxide and water in the air react together to form carbonic acid, a weak acid (pH 5.6 in distilled water), but unpolluted rain also contains other chemicals. Nitric oxide present during thunderstorm phenomena, caused by the oxidation of atmospheric nitrogen, can result in the production of acid rain, if nitric oxide forms compounds with the water molecules in precipitation, thus creating acid rain. Acid rain can damage infrastructures containing calcite or certain other solid chemical compounds. In ecosystems, acid rain can dissolve plant tissues of vegetations and increase acidification process in bodies of water and in soil, resulting in deaths of marine and terrestrial organisms. Any thunderstorm that produces hail that reaches the ground is known as a hailstorm. Thunderclouds that are capable of producing hailstones are often seen obtaining green coloration. Hail is more common along mountain ranges because mountains force horizontal winds upwards (known as orographic lifting), thereby intensifying the updrafts within thunderstorms and making hail more likely. One of the more common regions for large hail is across mountainous northern India, which reported one of the highest hail-related death tolls on record in 1888. China also experiences significant hailstorms. Across Europe, Croatia experiences frequent occurrences of hail. In North America, hail is most common in the area where Colorado, Nebraska, and Wyoming meet, known as "Hail Alley". Hail in this region occurs between the months of March and October during the afternoon and evening hours, with the bulk of the occurrences from May through September. Cheyenne, Wyoming is North America's most hail-prone city with an average of nine to ten hailstorms per season. In South America, areas prone to hail are cities like Bogotá, Colombia. Hail can cause serious damage, notably to automobiles, aircraft, skylights, glass-roofed structures, livestock, and most commonly, farmers' crops. Hail is one of the most significant thunderstorm hazards to aircraft. When hail stones exceed 13 millimetres (0.5 in) in diameter, planes can be seriously damaged within seconds. The hailstones accumulating on the ground can also be hazardous to landing aircraft. Wheat, corn, soybeans, and tobacco are the most sensitive crops to hail damage. Hail is one of Canada's most costly hazards. Hailstorms have been the cause of costly and deadly events throughout history. One of the earliest recorded incidents occurred around the 9th century in Roopkund, Uttarakhand, India. The largest hailstone in terms of maximum circumference and length ever recorded in the United States fell in 2003 in Aurora, Nebraska, United States. In June 2007, the town of Elie, Manitoba was struck by an F5 tornado. A tornado is a violent, rotating column of air in contact with both the surface of the earth and a cumulonimbus cloud (otherwise known as a thundercloud) or, in rare cases, the base of a cumulus cloud. 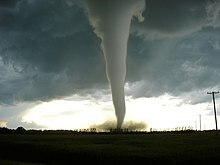 Tornadoes come in many sizes but are typically in the form of a visible condensation funnel, whose narrow end touches the earth and is often encircled by a cloud of debris and dust. Most tornadoes have wind speeds between 40 and 110 mph (64 and 177 km/h), are approximately 75 metres (246 ft) across, and travel several kilometers (a few miles) before dissipating. Some attain wind speeds of more than 300 mph (480 km/h), stretch more than 1,600 metres (1 mi) across, and stay on the ground for more than 100 kilometres (dozens of miles). The Fujita scale and the Enhanced Fujita Scale rate tornadoes by damage caused. An EF0 tornado, the weakest category, damages trees but not substantial structures. An EF5 tornado, the strongest category, rips buildings off their foundations and can deform large skyscrapers. The similar TORRO scale ranges from a T0 for extremely weak tornadoes to T11 for the most powerful known tornadoes. Doppler radar data, photogrammetry, and ground swirl patterns (cycloidal marks) may also be analyzed to determine intensity and award a rating. Waterspouts have similar characteristics as tornadoes, characterized by a spiraling funnel-shaped wind current that form over bodies of water, connecting to large cumulonimbus clouds. Waterspouts are generally classified as forms of tornadoes, or more specifically, non-supercelled tornadoes that develop over large bodies of water. These spiralling columns of air frequently develop within tropical areas close to the equator, but are less common within areas of high latitude. Flash flooding is the process where a landscape, most notably an urban environment, is subjected to rapid floods. These rapid floods occur more quickly and are more localized than seasonal river flooding or areal flooding and are frequently (though not always) associated with intense rainfall. Flash flooding can frequently occur in slow-moving thunderstorms and is usually caused by the heavy liquid precipitation that accompanies it. Flash floods are most common in densely populated urban environments, where few plants and bodies of water are present to absorb and contain the extra water. Flash flooding can be hazardous to small infrastructure, such as bridges, and weakly constructed buildings. Plants and crops in agricultural areas can be destroyed and devastated by the force of raging water. Automobiles parked within affected areas can also be displaced. Soil erosion can occur as well, exposing risks of landslide phenomena. Trees uprooted or displaced by the force of a downburst wind in northwest Monroe County, Wisconsin. Downburst winds can produce numerous hazards to landscapes experiencing thunderstorms. Downburst winds are generally very powerful, and are often mistaken for wind speeds produced by tornadoes, due to the concentrated amount of force exerted by their straight-horizontal characteristic. Downburst winds can be hazardous to unstable, incomplete, or weakly constructed infrastructures and buildings. Agricultural crops, and other plants in nearby environments can be uprooted and damaged. Aircraft engaged in takeoff or landing can crash. Automobiles can be displaced by the force exerted by downburst winds. Downburst winds are usually formed in areas when high pressure air systems of downdrafts begin to sink and displace the air masses below it, due to their higher density. When these downdrafts reach the surface, they spread out and turn into the destructive straight-horizontal winds. Thunderstorm asthma is the triggering of an asthma attack by environmental conditions directly caused by a local thunderstorm. During a thunderstorm, pollen grains can absorb moisture and then burst into much smaller fragments with these fragments being easily dispersed by wind. While larger pollen grains are usually filtered by hairs in the nose, the smaller pollen fragments are able to pass through and enter the lungs, triggering the asthma attack. Most thunderstorms come and go fairly uneventfully; however, any thunderstorm can become severe, and all thunderstorms, by definition, present the danger of lightning. Thunderstorm preparedness and safety refers to taking steps before, during, and after a thunderstorm to minimize injury and damage. Preparedness refers to precautions that should be taken before a thunderstorm. Some preparedness takes the form of general readiness (as a thunderstorm can occur at any time of the day or year). Preparing a family emergency plan, for example, can save valuable time if a storm arises quickly and unexpectedly. Preparing the home by removing dead or rotting limbs and trees, which can be blown over in high winds, can also significantly reduce the risk of property damage and personal injury. Know the names of local counties, cities, and towns, as these are how warnings are described. Monitor forecasts and weather conditions and know whether thunderstorms are likely in the area. Be alert for natural signs of an approaching storm. Cancel or reschedule outdoor events (to avoid being caught outdoors when a storm hits). Take action early so you have time to get to a safe place. Get inside a substantial building or hard-topped metal vehicle before threatening weather arrives. If you hear thunder, get to the safe place immediately. Avoid open areas like hilltops, fields, and beaches, and don't be or be near the tallest objects in an area when thunderstorms are occurring. Don't shelter under tall or isolated trees during thunderstorms. If in the woods, put as much distance as possible between you and any trees during thunderstorms. If in a group, spread out to increase the chances of survivors who could come to the aid of any victims from a lightning strike. Take action immediately upon hearing thunder. Anyone close enough to the storm to hear thunder can be struck by lightning. Avoid electrical appliances, including corded telephones. Cordless and wireless telephones are safe to use during a thunderstorm. Close and stay away from windows and doors, as glass can become a serious hazard in high wind. Do not bathe or shower, as plumbing conducts electricity. If driving, safely exit the roadway, turn on hazard lights, and park. Remain in the vehicle and avoid touching metal. The NWS stopped recommending the "lightning crouch" in 2008 as it doesn't provide a significant level of protection and will not significantly lower the risk of being killed or injured from a nearby lightning strike. A mild thunderstorm over Niagara Falls, Ontario. Thunderstorms occur throughout the world, even in the polar regions, with the greatest frequency in tropical rainforest areas, where they may occur nearly daily. At any given time approximately 2,000 thunderstorms are occurring on Earth. Kampala and Tororo in Uganda have each been mentioned as the most thunderous places on Earth, a claim also made for Singapore and Bogor on the Indonesian island of Java. Other cities known for frequent storm activity include Darwin, Caracas, Manila and Mumbai. Thunderstorms are associated with the various monsoon seasons around the globe, and they populate the rainbands of tropical cyclones. In temperate regions, they are most frequent in spring and summer, although they can occur along or ahead of cold fronts at any time of year. They may also occur within a cooler air mass following the passage of a cold front over a relatively warmer body of water. Thunderstorms are rare in polar regions because of cold surface temperatures. Some of the most powerful thunderstorms over the United States occur in the Midwest and the Southern states. These storms can produce large hail and powerful tornadoes. Thunderstorms are relatively uncommon along much of the West Coast of the United States, but they occur with greater frequency in the inland areas, particularly the Sacramento and San Joaquin Valleys of California. In spring and summer, they occur nearly daily in certain areas of the Rocky Mountains as part of the North American Monsoon regime. In the Northeast, storms take on similar characteristics and patterns as the Midwest, but with less frequency and severity. During the summer, air-mass thunderstorms are an almost daily occurrence over central and southern parts of Florida. If the quantity of water that is condensed in and subsequently precipitated from a cloud is known, then the total energy of a thunderstorm can be calculated. In a typical thunderstorm, approximately 5×108 kg of water vapor are lifted, and the amount of energy released when this condenses is 1015 joules. This is on the same order of magnitude of energy released within a tropical cyclone, and more energy than that released during the atomic bomb blast at Hiroshima, Japan in 1945. The Fermi Gamma-ray Burst Monitor results show that gamma rays and antimatter particles (positrons) can be generated in powerful thunderstorms. It is suggested that the antimatter positrons are formed in terrestrial gamma-ray flashes (TGF). TGFs are brief bursts occurring inside thunderstorms and associated with lightning. The streams of positrons and electrons collide higher in the atmosphere to generate more gamma rays. About 500 TGFs may occur every day worldwide, but mostly go undetected. In more contemporary times, thunderstorms have taken on the role of a scientific curiosity. Every spring, storm chasers head to the Great Plains of the United States and the Canadian Prairies to explore the scientific aspects of storms and tornadoes through use of videotaping. Radio pulses produced by cosmic rays are being used to study how electric charges develop within thunderstorms. More organized meteorological projects such as VORTEX2 use an array of sensors, such as the Doppler on Wheels, vehicles with mounted automated weather stations, weather balloons, and unmanned aircraft to investigate thunderstorms expected to produce severe weather. Lightning is detected remotely using sensors that detect cloud-to-ground lightning strokes with 95 percent accuracy in detection and within 250 metres (820 ft) of their point of origin. Thunderstorms strongly influenced many early civilizations. Greeks believed that they were battles waged by Zeus, who hurled lightning bolts forged by Hephaestus. Some American Indian tribes associated thunderstorms with the Thunderbird, who they believed was a servant of the Great Spirit. 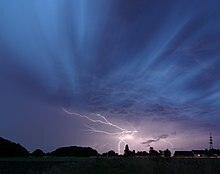 The Norse considered thunderstorms to occur when Thor went to fight Jötnar, with the thunder and lightning being the effect of his strikes with the hammer Mjölnir. Hinduism recognizes Indra as the god of rain and thunderstorms. Christian doctrine accepts that fierce storms are the work of God. These ideas were still within the mainstream as late as the 18th century. Martin Luther was out walking when a thunderstorm began, causing him to pray to God for being saved and promising to become a monk. Thunderstorms, evidenced by flashes of lightning, on Jupiter have been detected and are associated with clouds where water may exist as both a liquid and ice, suggesting a mechanism similar to that on Earth. (Water is a polar molecule that can carry a charge, so it is capable of creating the charge separation needed to produce lightning.) These electrical discharges can be up to a thousand times more powerful than lightning on the Earth. The water clouds can form thunderstorms driven by the heat rising from the interior. The clouds of Venus may also be capable of producing lightning; some observations suggest that the lightning rate is at least half of that on Earth. ^ "Weather Glossary – T". National Weather Service. 21 April 2005. Retrieved 2006-08-23. ^ "NWS JetStream". National Weather Service. Retrieved 26 January 2019. ^ National Severe Storms Laboratory (September 1992). "tornadoes...Nature's Most Violent Storms". A PREPAREDNESS GUIDE. National Oceanic and Atmospheric Administration. Retrieved 2008-08-03. ^ Albert Irvin Frye (1913). Civil engineers' pocket book: a reference-book for engineers, contractors. D. Van Nostrand Company. p. 462. Retrieved 2009-08-31. ^ Yikne Deng (2005). Ancient Chinese Inventions. Chinese International Press. pp. 112–13. ISBN 978-7-5085-0837-5. Retrieved 2009-06-18. ^ FMI (2007). "Fog And Stratus – Meteorological Physical Background". Zentralanstalt für Meteorologie und Geodynamik. Retrieved 2009-02-07. ^ Chris C. Mooney (2007). Storm world: hurricanes, politics, and the battle over global warming. Houghton Mifflin Harcourt. p. 20. ISBN 978-0-15-101287-9. Retrieved 2009-08-31. ^ David O. Blanchard (September 1998). "Assessing the Vertical Distribution of Convective Available Potential Energy". Weather and Forecasting. American Meteorological Society. 13 (3): 870–7. Bibcode:1998WtFor..13..870B. doi:10.1175/1520-0434(1998)013<0870:ATVDOC>2.0.CO;2. ^ a b c d e Michael H. Mogil (2007). Extreme Weather. New York: Black Dog & Leventhal Publisher. pp. 210–211. ISBN 978-1-57912-743-5. ^ a b c d National Severe Storms Laboratory (2006-10-15). "A Severe Weather Primer: Questions and Answers about Thunderstorms". National Oceanic and Atmospheric Administration. Retrieved 2009-09-01. ^ a b Gianfranco Vidali (2009). "Rough Values of Various Processes". University of Syracuse. Archived from the original on 2010-03-15. Retrieved 2009-08-31. ^ Pilot's Web The Aviator's Journal (2009-06-13). "Structural Icing in VMC". Retrieved 2009-09-02. ^ a b c d Jon W. Zeitler & Matthew J. Bunkers (March 2005). "Operational Forecasting of Supercell Motion: Review and Case Studies Using Multiple Datasets" (PDF). National Weather Service Forecast Office, Riverton, Wyoming. Retrieved 2009-08-30. ^ The Weather World 2010 Project (2009-09-03). "Vertical Wind Shear". University of Illinois. Retrieved 2006-10-21. ^ T. T. Fujita (1985). The Downburst, microburst and macroburst: SMRP Research Paper 210. ^ Markowski, Paul and Yvette Richardson. Mesoscale Meteorology in Midlatitudes. John Wiley & Sons, Ltd., 2010. pp. 209. ^ Maddox, R.A., C.F. Chappell, and L.R. Hoxit, (1979). Synoptic and meso-α scale aspects of flash flood events. Bull. Amer. Meteor. Soc., 60, 115-123. ^ Schnetzler, Amy Eliza. Analysis of Twenty-Five Years of Heavy Rainfall Events in the Texas Hill Country. University of Missouri-Columbia, 2008. pp. 74. ^ Markowski, Paul and Yvette Richardson. Mesoscale Meteorology in Midlatitudes. John Wiley & Sons, Ltd., 2010. pp. 215, 310. ^ Glossary of Meteorology (2009). "Squall line". American Meteorological Society. Archived from the original on 2008-12-17. Retrieved 2009-06-14. ^ Glossary of Meteorology (2009). "Prefrontal squall line". American Meteorological Society. Archived from the original on 2007-08-17. Retrieved 2009-06-14. ^ University of Oklahoma (2004). "The Norwegian Cyclone Model" (PDF). Archived from the original (PDF) on September 1, 2006. Retrieved 2007-05-17. ^ Office of the Federal Coordinator for Meteorology (2008). "Chapter 2: Definitions" (PDF). NOAA. pp. 2–1. Archived from the original (PDF) on 2009-05-06. Retrieved 2009-05-03. ^ Glossary of Meteorology (2009). "Bow echo". American Meteorological Society. Archived from the original on 2011-06-06. Retrieved 2009-06-14. ^ Glossary of Meteorology (2009). Line echo wave pattern. American Meteorological Society. ISBN 978-1-878220-34-9. Archived from the original on 2008-09-24. Retrieved 2009-05-03. ^ Stephen F. Corfidi; Jeffry S. Evans & Robert H. Johns (2015). "About Derechos". Storm Prediction Center, NCEP, NWS, NOAA Web Site. Retrieved 2015-02-17. ^ Glossary of Meteorology (2009). Heat burst. American Meteorological Society. ISBN 978-1-878220-34-9. Archived from the original on 2011-06-06. Retrieved 2009-06-14. ^ "Squall lines and "Shi Hu Feng" – what you want to know about the violent squalls hitting Hong Kong on 9 May 2005". Hong Kong Observatory. 17 June 2005. Retrieved 2006-08-23. ^ "Supercell Thunderstorms". Weather World 2010 Project. University of Illinois. October 4, 1999. Retrieved 2006-08-23. ^ National Weather Service (2005-04-21). "Weather Glossary – S". National Oceanic and Atmospheric Administration. Retrieved 2007-06-17. ^ Kim Runk (2009). 1" Hail (.wmv). Silver Spring, Maryland: NOAA. ^ Environment Canada Ontario Region (2005-05-24). "Fact Sheet – Summer Severe Weather Warnings". Archived from the original on 2009-02-28. Retrieved 2009-09-03. ^ Glossary of Meteorology (2009). "Mesoscale convective system". American Meteorological Society. Archived from the original on 2011-06-06. Retrieved 2009-06-27. ^ William R. Cotton; Susan van den Heever & Israel Jirak (2003). "Conceptual Models of Mesoscale Convective Systems: Part 9" (PDF). Colorado State University. Retrieved 2008-03-23. ^ C. Morel & S. Senesi (2002). "A climatology of mesoscale convective systems over Europe using satellite infrared imagery II: Characteristics of European mesoscale convective systems". Quarterly Journal of the Royal Meteorological Society. 128 (584): 1973. Bibcode:2002QJRMS.128.1973M. doi:10.1256/003590002320603494. ISSN 0035-9009. Retrieved 2008-03-02. ^ Semyon A. Grodsky & James A. Carton (2003-02-15). "The Intertropical Convergence Zone in the South Atlantic and the Equatorial Cold Tongue" (PDF). University of Maryland, College Park. Retrieved 2009-06-05. ^ Michael Garstang; David Roy Fitzjarrald (1999). Observations of surface to atmosphere interactions in the tropics. Oxford University Press US. pp. 40–41. ISBN 978-0-19-511270-2. ^ B. Geerts (1998). "Lake Effect Snow". University of Wyoming. Retrieved 2008-12-24. ^ E. A. Rasmussen & J. Turner (2003). Polar Lows: Mesoscale Weather Systems in the Polar Regions. Cambridge University Press. p. 612. ISBN 978-0-521-62430-5. ^ Lance F. Bosart & Thomas J. Galarneau Jr. (2005). "3.5 The Influence of the Great Lakes on Warm Season Weather Systems During BAMEX" (PDF). 6th American Meteorological Society Coastal Meteorology Conference. Retrieved 2009-06-15. ^ William R. Cotton; Susan van den Heever & Israel Jirak (Fall 2003). "Conceptual Models of Mesoscale Convective Systems: Part 9" (PDF). Retrieved 2008-03-23. ^ Stephen Corfidi (2015-02-04). "MCS Movement and Behavior (PowerPoint)". National Weather Service, Storm Prediction Center. Retrieved 2015-02-18. ^ National Weather Service (2009-09-01). "Types of Thunderstorms". National Weather Service Southern Region Headquarters. Retrieved 2009-09-03. ^ David Flower (2008-02-09). "Boscastle Flood 2004". Tintagel – King Arthur Country. Retrieved 2009-09-03. ^ Jayesh Phadtare (2018). "Role of Eastern Ghats Orography and Cold Pool in an Extreme Rainfall Event over Chennai on 1 December 2015". Monthly Weather Review. American Meteorological Society. 146 (4): 943–965. doi:10.1175/MWR-D-16-0473.1. ^ Scott, A (2000). "The Pre-Quaternary history of fire". Palaeogeography, Palaeoclimatology, Palaeoecology. 164 (1–4): 281. Bibcode:2000PPP...164..281S. doi:10.1016/S0031-0182(00)00192-9. ^ Vladimir A. Rakov (1999). "Lightning Makes Glass". University of Florida, Gainesville. Retrieved November 7, 2007. ^ Bruce Getz & Kelli Bowermeister (2009-01-09). "Lightning and Its Hazards". Hughston Sports Medicine Foundation. Archived from the original on 2010-01-24. Retrieved 2009-09-09. ^ Charles H. Paxton; J. Colson & N. Carlisle (2008). "P2.13 Florida lightning deaths and injuries 2004–2007". American Meteorological Society. Retrieved 2009-09-05. ^ G. E. Likens; W. C. Keene; J. M. Miller & J. N. Galloway (1987). "Chemistry of precipitation from a remote, terrestrial site in Australia". Journal of Geophysical Research. 92 (13): 299–314. Bibcode:1987JGR....92..299R. doi:10.1029/JA092iA01p00299. ^ Joel S. Levine; Tommy R. Augustsson; Iris C. Andersont; James M. Hoell Jr. & Dana A. Brewer (1984). "Tropospheric sources of NOx: Lightning and biology". Atmospheric Environment. 18 (9): 1797–1804. Bibcode:1984AtmEn..18.1797L. doi:10.1016/0004-6981(84)90355-X. PMID 11540827. ^ Office of Air and Radiation Clean Air Markets Division (2008-12-01). "Effects of Acid Rain – Surface Waters and own Aquatic Animals". United States Environmental Protection Agency. Retrieved 2009-09-05. ^ Glossary of Meteorology (2009). "Hailstorm". American Meteorological Society. Archived from the original on 2011-06-06. Retrieved 2009-08-29. ^ Geoscience Australia (2007-09-04). "Where does severe weather occur?". Commonwealth of Australia. Archived from the original on 2009-06-21. Retrieved 2009-08-28. ^ a b John E. Oliver (2005). Encyclopedia of World Climatology. Springer. p. 401. ISBN 978-1-4020-3264-6. Retrieved 2009-08-28. ^ Dongxia Liu; Guili Feng & Shujun Wu (February 2009). "The characteristics of cloud-to-ground lightning activity in hailstorms over northern China". Atmospheric Research. 91 (2–4): 459–465. Bibcode:2009AtmRe..91..459L. doi:10.1016/j.atmosres.2008.06.016. ^ Damir Počakal; Željko Večenaj & Janez Štalec (2009). "Hail characteristics of different regions in continental part of Croatia based on influence of orography". Atmospheric Research. 93 (1–3): 516. Bibcode:2009AtmRe..93..516P. doi:10.1016/j.atmosres.2008.10.017. ^ Rene Munoz (2000-06-02). "Fact Sheet on Hail". University Corporation for Atmospheric Research. Archived from the original on 2009-10-15. Retrieved 2009-07-18. ^ a b Nolan J. Doesken (April 1994). "Hail, Hail, Hail ! The Summertime Hazard of Eastern Colorado" (PDF). Colorado Climate. 17 (7). Retrieved 2009-07-18. ^ Federal Aviation Administration (2009). "Hazards". Retrieved 2009-08-29. ^ Damon P. Coppola (2007). Introduction to international disaster management. Butterworth-Heinemann. p. 62. ISBN 978-0-7506-7982-4. ^ David Orr (2004-11-07). "Giant hail killed more than 200 in Himalayas". Telegraph Group Unlimited via the Internet Wayback Machine. Archived from the original on 2005-12-03. Retrieved 2009-08-28. ^ C. A. Knight and N.C. Knight, 2005: Very Large Hailstones From Aurora, Nebraska. Bull. Amer. Meteor. Soc., 86, 1773–1781. ^ Renno, Nilton O. (August 2008). "A thermodynamically general theory for convective vortices" (PDF). Tellus A. 60 (4): 688–99. Bibcode:2008TellA..60..688R. doi:10.1111/j.1600-0870.2008.00331.x. ^ Edwards, Roger (2006-04-04). "The Online Tornado FAQ". Storm Prediction Center. Retrieved 2006-09-08. ^ "Doppler On Wheels". Center for Severe Weather Research. 2006. Archived from the original on 2007-02-05. Retrieved 2006-12-29. ^ "Hallam Nebraska Tornado". Omaha/Valley, NE Weather Forecast Office. 2005-10-02. Retrieved 2006-09-08. ^ Dr. Terence Meaden (2004). "Wind Scales: Beaufort, T – Scale, and Fujita's Scale". Tornado and Storm Research Organisation. Archived from the original on 2010-04-30. Retrieved 2009-09-11. ^ Storm Prediction Center. "Enhanced F Scale for Tornado Damage". National Oceanic and Atmospheric Administration. Retrieved 2009-06-21. ^ "Waterspout". American Meteorological Society. 2009. Archived from the original on 2008-06-20. Retrieved 2009-09-11. ^ Glossary of Meteorology (2009). "Flash Flood". American Meteorological Society. Archived from the original on 2011-06-06. Retrieved 2009-09-09. ^ National Weather Service. "Flood Products: What Do They Mean?". NOAA. Retrieved 23 August 2011. ^ National Weather Service. "Flash Flood". NOAA. Retrieved 23 August 2011. ^ a b National Weather Service Forecast Office Columbia, South Carolina (2009-01-27). "Downbursts..." National Weather Service Eastern Region Headquarters. Retrieved 2009-09-09. ^ a b c d e American Red Cross. "Thunderstorm Safety Checklist" (PDF). American Red Cross. Retrieved 24 August 2011. ^ a b c d National Weather Service Weather Forecast Office. "Thunderstorm". Severe Weather Preparedness Information. Albuquerque, NM: NOAA. Retrieved 24 August 2011. ^ Federal Emergency Management Agency. "Thunderstorms and Lightning". Ready. US Department of Homeland Security. Archived from the original on 23 June 2011. Retrieved 24 August 2011. ^ a b c Federal Emergency Management Agency. "What to Do Before a Thunderstorm". US Department of Homeland Security. Archived from the original on 20 August 2011. Retrieved 24 August 2011. ^ a b c d e f g h i j "NWS Lightning Safety Myths". Lightningsafety.noaa.gov. 2014-06-30. Retrieved 2014-08-20. ^ "NWS JetStream – Lightning Frequently Asked Questions". Srh.noaa.gov. 2014-06-28. Retrieved 2014-08-20. ^ "You're not safer crouching: Six things you didn't know about lightning". LA Times. Retrieved 2014-08-20. ^ National Geographic Almanac of Geography, ISBN 0-7922-3877-X, page 75. ^ "How many thunderstorms occur each year?". Thunderstorms. Sky Fire Productions. Archived from the original on 2007-07-11. Retrieved 2006-08-23. ^ National Weather Service JetStream (2008-10-08). "Tropical Cyclone Hazards". National Weather Service Southern Region Headquarters. Retrieved 2009-08-30. ^ David Roth. "Unified Surface Analysis Manual" (PDF). Hydrometeorological Prediction Center. Retrieved 2006-10-22. ^ Office of the Federal Coordinator for Meteorology (2001-06-07). "National Severe Local Storms Operations Plan – Chapter 2" (PDF). Department of Commerce. Archived from the original (PDF) on 2009-05-06. Retrieved 2006-08-23. ^ Garner, Rob (26 June 2015). "Fermi Catches Antimatter-Hurling Storms". nasa.gov. Retrieved 19 July 2016. ^ Ouellette, Jennifer (January 13, 2011). "Fermi Spots Antimatter in Thunderstorms". Discovery News. Retrieved 16 January 2011. ^ Alan Moller (2003-03-05). "Storm Chase Ethics". Retrieved 2009-09-09. ^ Florida Institute of Technology (2009-06-02). "Scientists use high-energy particles from space to probe thunderstorms". Retrieved 2009-09-09. ^ VORTEX2 (2009). "What is VORTEX2?". Retrieved 2009-09-09. ^ Peter P. Neilley & R. B. Bent (2009). "An Overview of the United States Precision Lightning Network (USPLN)". American Meteorological Society Fourth Conference on the Meteorological Applications of Lightning Data. Retrieved 2009-09-09. ^ John D. Cox (2002). Storm Watchers. John Wiley & Sons, Inc. p. 7. ISBN 978-0-471-38108-2. ^ "Martin Luther". Christian History. Retrieved 6 July 2016. ^ Elkins-Tanton, Linda T. (2006). Jupiter and Saturn. New York: Chelsea House. ISBN 978-0-8160-5196-0. ^ Watanabe, Susan, ed. (February 25, 2006). "Surprising Jupiter: Busy Galileo spacecraft showed jovian system is full of surprises". NASA. Retrieved 2007-02-20. ^ Kerr, Richard A. (2000). "Deep, Moist Heat Drives Jovian Weather". Science. 287 (5455): 946–947. doi:10.1126/science.287.5455.946b. Retrieved 2007-02-24. ^ Russell, S. T.; Zhang, T.L. ; Delva, M.; et al. (2007). "Lightning on Venus inferred from whistler-mode waves in the ionosphere". Nature. 450 (7170): 661–662. Bibcode:2007Natur.450..661R. doi:10.1038/nature05930. PMID 18046401. Davies, J. M., 2004: Estimations of CIN and LFC associated with tornadic and nontornadic supercells. Weather Forecast., 19, 714–726. Doswell, C.A., III, D. V. Baker, and C. A. Liles, 2002: Recognition of negative factors for severe weather potential: A case study. Weather Forecast., 17, 937–954. Wikimedia Commons has media related to Thunderstorms. Wikivoyage has a travel guide for Thunderstorms. This page was last edited on 16 April 2019, at 13:35 (UTC).